A little over two years ago I took a look at the indie point and click game Nelly Cootalot: The Fowl Fleet which was published by Application Systems Heidelberg. Nelly Cootalot: The Fowl Fleet surprised me as it was significantly better than I was expecting with good puzzle design and a charming story. I bring this up because today I am looking at another game published by Application Systems Heidelberg, Unforeseen Incidents. When I first saw the Unforeseen Incidents trailer I could see the game’s quality but I was a little worried that the game’s story looked kind of generic. With how much I enjoyed Nelly Cootalot: The Fowl Fleet though I decided to give the game a chance. Unforeseen Incidents is a compelling point and click game with an engaging story and strong puzzle design that may not be perfect but is an enjoyable experience. We at Geeky Hobbies would like to thank Backwoods Entertainment and Application Systems Heidelberg for the review copy of Unforeseen Incidents used for this review. Other than receiving a free copy of the game to review, we at Geeky Hobbies received no other compensation for this review. In Unforeseen Incidents you play as Harper Pendrell. Harper is the local handyman for his small hometown. His hometown is usually quiet but a dangerous disease has recently been impacting the town. One day while returning home Harper encounters a woman that has contracted the disease. While investigating the mysterious woman Harper uncovers a conspiracy involving the disease. Can Harper uncover the truth in time to stop the disease from spreading and threatening all of humankind? At its core Unforeseen Incidents is a point and click game. For those of you who have never played a point and click game before, you mostly pick up and interact with objects as well as talk with people in order to solve puzzles and advance the story. In this regard Unforeseen Incidents is basically the same as most games from the genre. If you have ever played a point and click game before you can basically pick up the game and immediately know what you are supposed to do. The only somewhat unique gameplay mechanic is that you are equipped with a multi-tool which gives you several tools that you will use throughout your journey. While it doesn’t drastically change the gameplay, I thought the addition was really clever as the game does a good job utilizing it for the puzzles. As most games in the point and click genre basically share the same gameplay, what separates the good games from the bad games in the genre is the story and puzzle design. I will get to the story shortly but I want to first talk about Unforeseen Incidents puzzle design. Puzzle design in point and click games is usually pretty tricky to get right. Make the puzzles too easy and straightforward and the game can suffer as you don’t feel challenged at all as you breeze from one puzzle to another. Even worse though are the point and click games that contain nonsensical puzzles where you either have to be on the same wavelength as the puzzle designer to figure them out or you have to try every option until you find the one correct solution. For the most part I think Unforeseen Incidents does a good job balancing between these two extremes. The puzzles aren’t so easy that they provide no challenge. At the same time they make logical sense where you can figure out what you are supposed to do without having to resort to trying every single option. In general I would say that the puzzles are moderately difficult. If you carefully think about the conversations that you have had along with the items you have in your possession, you should be able to piece together what you have to do at any given time. What I liked most about the puzzles is that they are pretty clever and well designed. When you start each chapter you are quickly presented with a group of tasks that you need to accomplish in order to proceed to the next chapter. Some of these tasks you can complete in any order but the game also relies on a lot of the tasks being interlinked. For a lot of the puzzles you have to complete part of one task to get either an item or information which you then use to complete part of another task. I think the game does a great job interconnecting all of the items and information. The puzzles for the most part are interesting and give you a sense of accomplishment when you solve them. While I really liked Unforeseen Incidents puzzle design, I will admit that occasionally the game gets a little frustrating. This isn’t due to convoluted puzzles and has more to do with not finding all of the necessary items or information. Almost all of the times that I have gotten stuck in the game have come down to missing an item that I could have picked up or forgetting to talk again with a character after I advanced the story. Without the necessary information/items I was unable to progress the story. I do appreciate that the game has a button that you can press that shows all of the items that you can click on which really helps finding items that you missed picking up. You likely will get stuck in a few situations where you can’t advance until you find the missing item/information though. Generally if you get stuck I would recommend talking with all of the characters again as they may give you the additional information you need to proceed. Outside of the puzzle design, the story is usually the next most important thing for point and click games. I have to admit that before playing Unforeseen Incidents I was a little concerned about the story. The game’s trailer was well produced but I feared that the story seemed a little generic. A conspiracy that threatens the world seemed like a story that I have played through too many times in video games. Despite some early hesitations, I have to say that I have enjoyed Unforeseen Incidents story more than I was expecting. The story is darker than your typical point and click game but it is quite interesting and well written. The dialog is also quite clever and surprisingly funny for a game with a darker tone. Generally in video game reviews I don’t spend a lot of time talking about a game’s visuals/music/atmosphere as I am usually more interested in the actual gameplay. While a game’s presentation is helpful, it is more important to have good gameplay as it doesn’t matter how good the game looks/sounds if the gameplay is terrible. 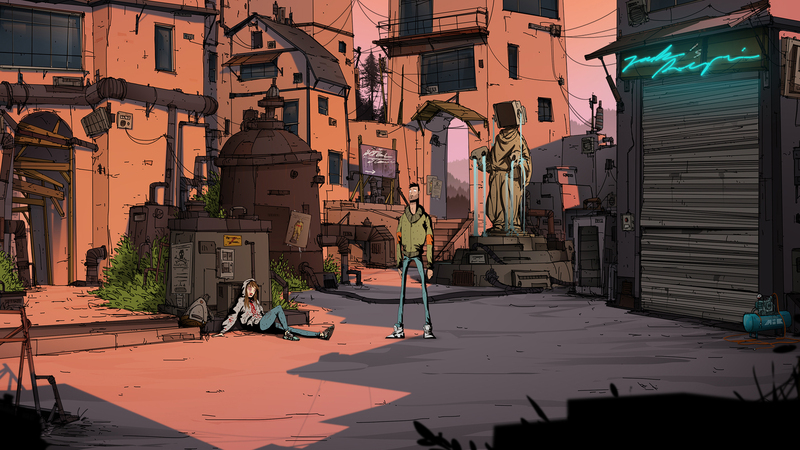 I wanted to bring up Unforeseen Incidents’ atmosphere though because it adds quite a bit to the game. While the game still would have been good without it, the effort put into the artwork and audio takes the game to the next level. The game’s artwork is really well done and looks like it could have been taken from a comic/graphic novel. The audio is also surprisingly good. The voice work in particular is a lot better than you would expect from this type of indie point and click game. As far as length at the time of this review I have only completed around half of the game. Unforeseen Incidents consists of four chapters and I have completed the first two. Based on my experience with the first two chapters I would say that each chapter seems to take around 2-3 hours to complete. Unless there is a significant jump in the difficulty or length in the last two chapters, I would say that the game should take most people around 10 hours or so to complete. Like with most point and click games though I don’t see Unforeseen Incidents having a lot of replay value outside of trying to get all of the achievements. The game seems to have a few areas where you can slightly alter the story but I don’t think it will ultimately lead to the story changing much. Unforeseen Incidents might not revolutionize the genre but it is still a great point and click game. For the most part the gameplay is the same as the rest of the genre as you click on things to solve puzzles and advance the story. Unforeseen Incidents does a good job with the puzzle design though balancing between being too easy and frustratingly difficult. The puzzles are creative making players think while not being so obscure that you can’t figure out what to do. The only problem that I had with the puzzle design is that you will occasionally run into a roadblock where you don’t have the necessary item or information to proceed on your current course so you have to go back and find what you missed. On top of good puzzle design the game has an intriguing story and a great atmosphere due to the artwork and audio. At around 10 hours the game’s length is also pretty good for this type of game. Unforeseen Incidents is a good/great point and click game. If you don’t really care for point and click games it is unlikely to change your mind. If you like the genre though and are intrigued by the game’s theme, I think you will really enjoy the game. I would highly recommend that point and click fans check out Unforeseen Incidents. The puzzles are creative and do a good job balancing between being too easy or difficult. Engaging story and surprisingly witty dialogue. You occasionally get stuck because you can't find a specific item or piece of information. The puzzles might feel a little too easy for point and click experts.